Opsigalea blanchardi Todd, 1966, Proc. Ent. Soc. Washington, 68:149, figs. 1,5 7. 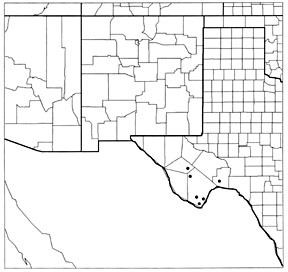 Diagnosis: Opsigalea blanchardi is the only species of the genus known from the United States and cannot be mistaken for any other noctuid living north of the Mexican border. 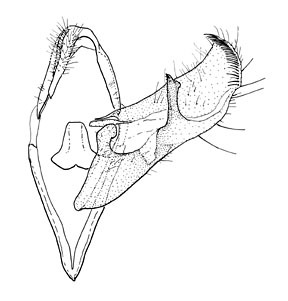 In particular the elongate forewings and the eye like spot in the tornus are particularly diagnostic. This species is clearly related to the Mexican species Opsigalea ocellata (Walker) and looks like a miniature version. 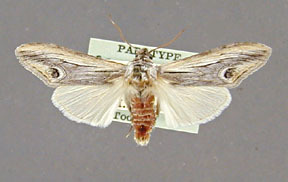 The modal length of the forewing is 17 mm in blanchardi and 23 mm in ocellata. Wing length from base to apex: mean = 16.98 mm., standard deviation = 0.79 mm., n = 10. 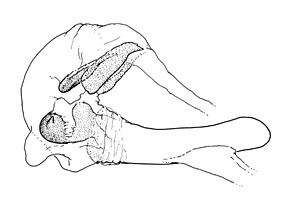 Distribution: This species has been collected only in western Texas. Foodplants: Opsigalea ocellata has been reared from Buddleja sessiliflora, a shrub or small tree in the family Loganiaceae.